Did you think I had forgotten you all? Never! But I will say that nursing two sick little boys, and then adding one sick hubby to the mix didn't leave me with oodles of time for blogging. I've just been mellowing with them, and trying to see their needs. Add to that, both of my little peeps seem to be getting very cuddly and wanting us to just BE with them (possibly a response to the fact that the baby will be here in the next couple of weeks)... how could I refuse? (eg. this afternoon Little C didn't/couldn't/wouldn't stay in his bed for his nap... so I ended up cuddling up with him in our bed, and he fell asleep in a flash... so did I, but not for too long. One Cosmo mag and I ended up whiling away a little time till he woke up). 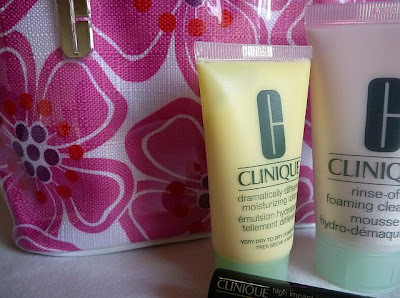 I will be the first to say that I use some of the products that Clinique has on offer - not all, but some. And there are some of them that I find absolutely fabulous (Why ever did they discontinue their "Sugarplump" lip gloss - seriously - that was MY lip gloss!!!). Have you tried their Deep Comfort Body Butter? Bliss. Not TOO fragrant. Just right. *Mini tube of high impact mascara in "11 Brightening Black"
All put together in a funky floral Clinique cosmetic bag. 1. Be a follower. If you aren't already a follower, you are welcome to become one and still enter. Leave a comment letting me know that you are following. 2. Share this post with a friend and come back and leave a separate comment letting me know that you did. 3. Blog this giveaway and come back and leave a separate comment letting me know that you did. N.B. This giveaway is in no way endorsed by Clinique. I just wanted to share some goodies with you! P.S. The Fiammone Yarn Giveaway from Simple Little Luxuries is still open. All giveaways will be open till June 10, 12pm to give me time to get them in the post before this baby arrives (Unless it arrives before hand - in which case they will be open till I get home from the Hospital! ).